If you are looking for the perfect chocolatey bite you’ve come to the right place. These Chocolate Chip Shortbread Cookies are great with a cup of coffee or dunked into a big ole glass of milk. 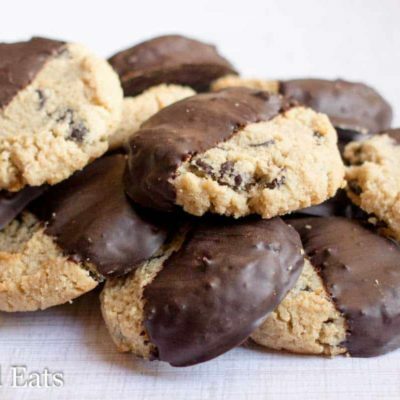 Give this chocolate chip shortbread recipe a try today, you won’t be disappointed. The cookies just keep on coming! This is the time of year I eat cookies for breakfast more days than not. Anyway, these are fabulous. 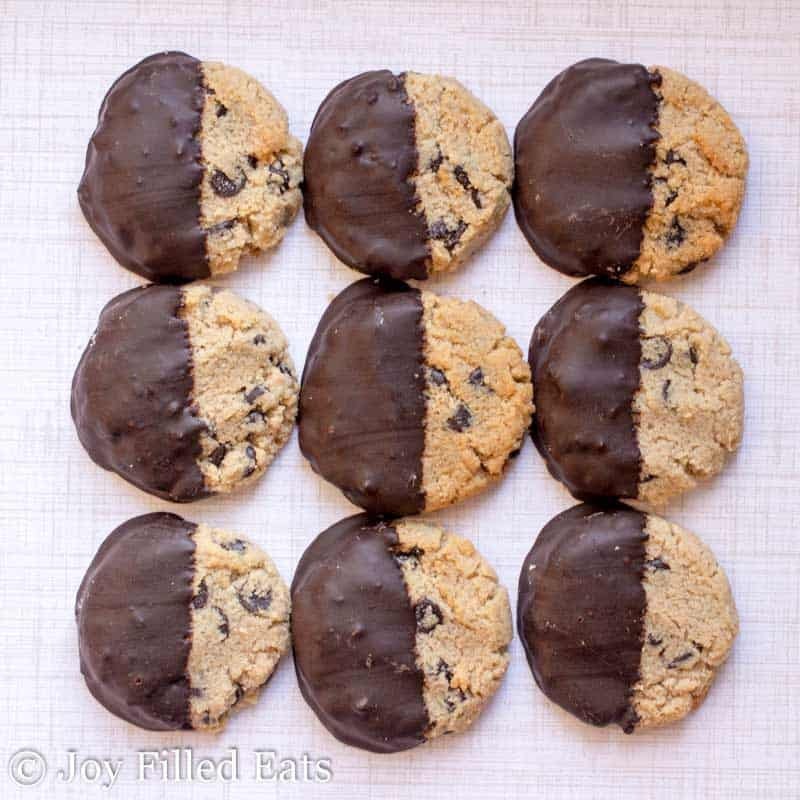 They are so easy and are right in between a traditional chocolate chip cookie and a traditional shortbread. A perfect combination in my opinion. The chocolate dip just adds to the flavor and makes them look a little bit fancy. If you follow me on Instagram you may have seen this status. Yes, I really forgot to add the sweetener to the first batch. Thankfully I realized before I baked them. All that finger licking comes in handy. 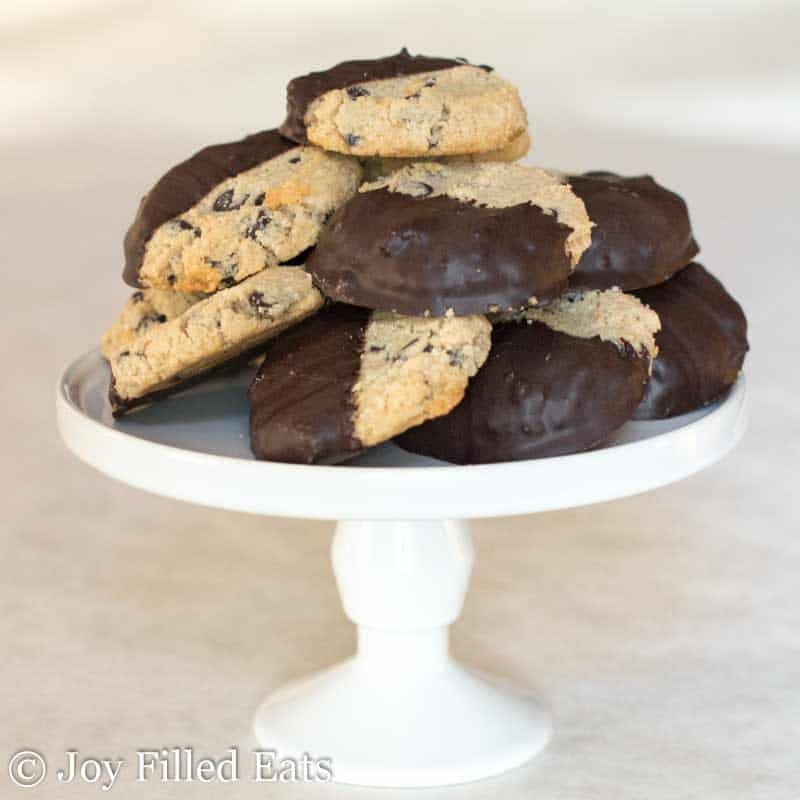 If you are following dietary needs and need a low carb, grain-free or sugar-free option, these chocolate chip shortbread cookies are the way to go. 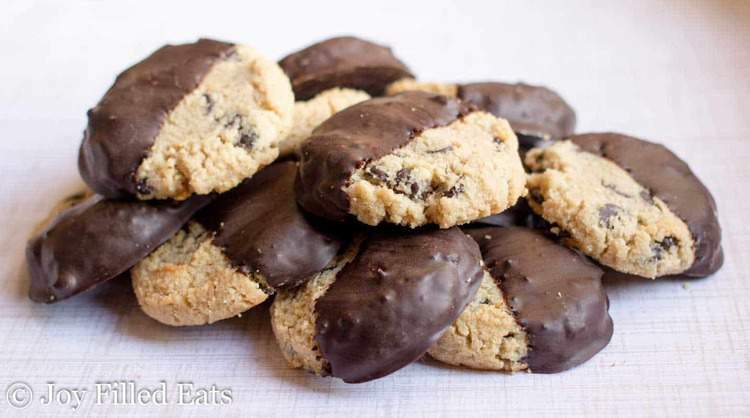 You get that shortbread flavor with bits of chocolate chips in each bite, that feels like such a reward. You can’t tell they are a healthier version than other shortbread cookies, which is a nice plus. so that I can aim to get the same size of cookies in every batch. Not because I have to have the same size cookies for OCD reasons, but because when your cookies are the same size, they cook more evenly. You don’t run into over-cooked cookies and under-cooked. It helps give you perfect cookies across the cookie sheet, which is awesome! For dipping your cookies I find that dipping just half the cookie gives you that perfect amount of sweetness in the cookie. Plus it offers a stunning presentation. Sometimes if I am feeling festive, I have even topped it with a few sprinkles to fit the season or holiday we are in. I find little kids love the pop of color! 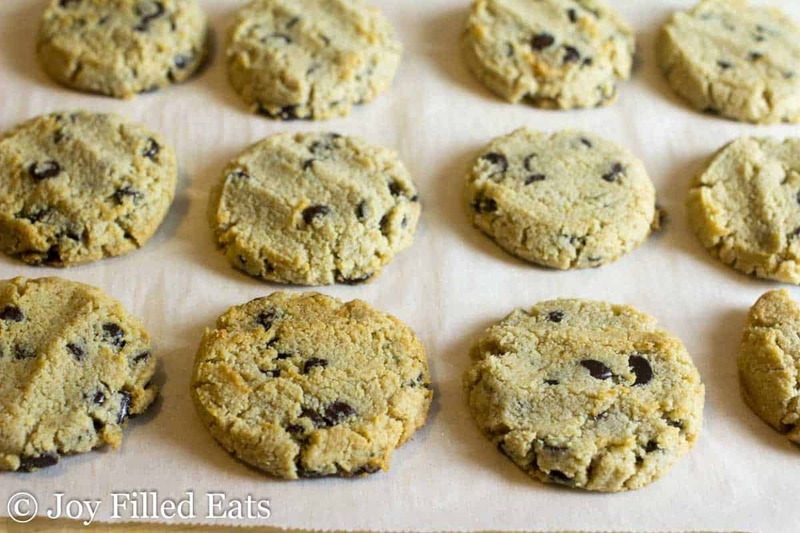 These cookies are one of the quickest to make. Just around 15 minutes prep you have fresh homemade cookies in around 30 minutes. I love using my homemade sweetener as I find it adds the right amount of sweet to the cookies, but you can always use Trim Healthy Mama Gentle Sweet if you prefer. 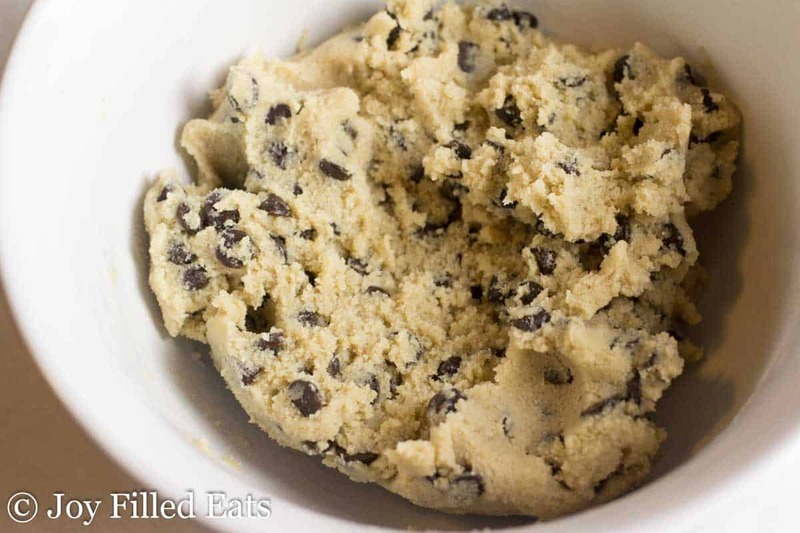 Having sugar free chocolate chips is also a great way to ensure you are making low carb cookies that everyone can enjoy. Gluten-free and low carb chocolate chip shortbread cookies that taste so sinfully good, no one has to know. I will have enough cookies to cover this tray and one other one by Christmas. Cookies are a necessity in my home this time of year. As long as I stop sneaking them from the freezer I should be good. Between the shortbread cookies and the peanut butter cup cookies, I find myself getting in trouble sneaking them from time to time. If you like your chocolate chip cookies on the crisp side these are perfection. My low carb and keto Chocolate Chip Shortbread Cookies are the perfect snack or dunker for your coffee. Next, combine the first 6 dough ingredients in the food processor and pulse until a uniform dough forms. Stir in the chocolate chips. 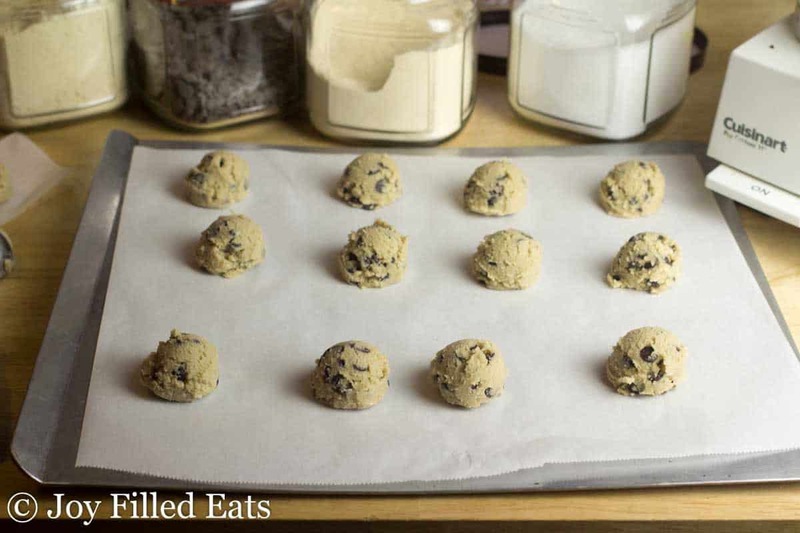 Divide into 16 balls and put on a parchment-lined baking sheet. Press down with your fingers. Bake for 16-18 minutes or until lightly browned around the edges. Cool completely. Melt the chocolate in the microwave or in a double boiler. I melt chocolate in the microwave stirring every thirty seconds. Add the sweetener if you are using 85% chocolate. 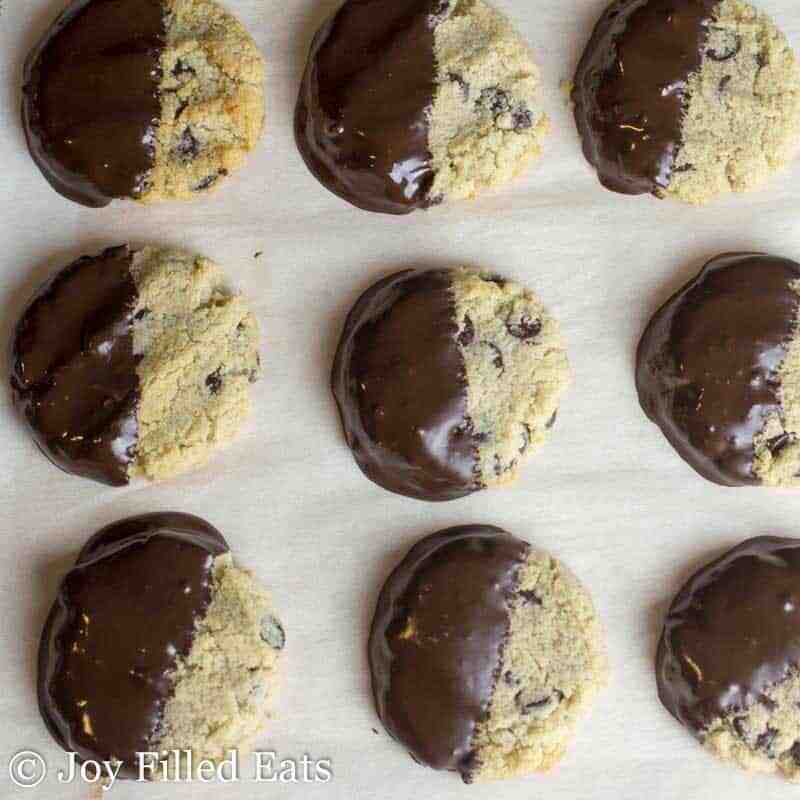 Dip the cookies halfway into the chocolate. Let the excess drip off and set them on waxed paper to harden. These look good. What can I substitute for the coconut flour, as I can't get it where I live? Can I add more almond flour, and if so how much? Yes, I think all almond flour would work. I'd try 1.5 cups total for the almond flour. If I want to use eggs instead of gelatin, how many should I use? You can use 1 whole egg but your cookies will be cakey, not crisp. I don't get unkind comments when you are offering us a free recipe. I appreciate your posts and can't wait to try this. Thank you!! Hi, Taryn! 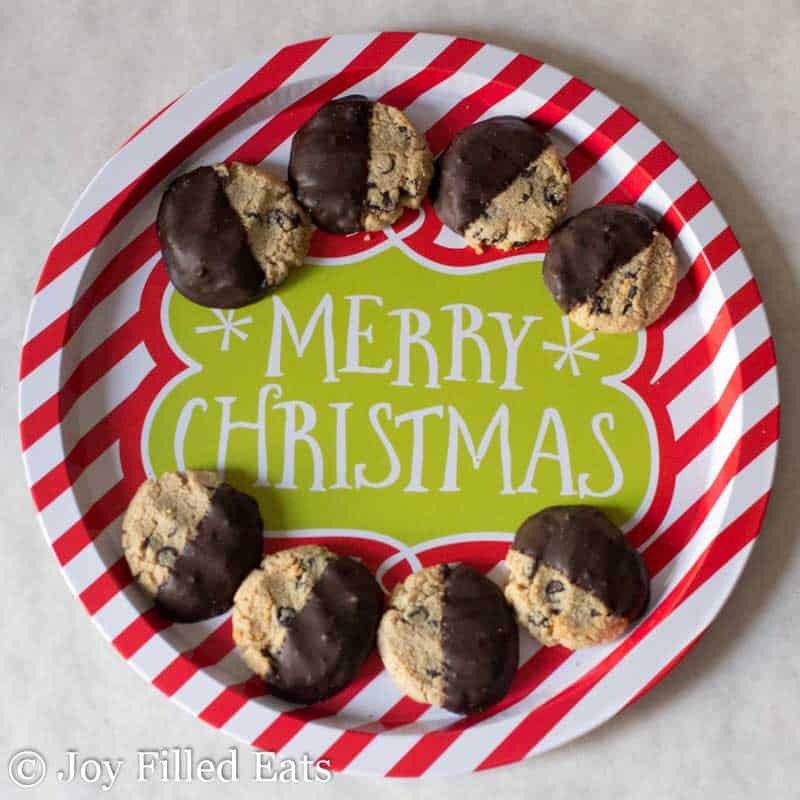 These look amazing and I would love to make today. I am out of coconut flour though. I do have THM baking blend though. Would the amount of thm flour be the same as your almond flour and coconut flour? Thanks!! They will not come out as crispy with all baking blend. If you have almond flour I would use 1 cup almond flour and 1/3 cup baking blend. Funny/not funny story: I mixed these up in my Vitamix. Without realizing it the almond flour on the bottom of the container turned into almond butter while I was manually pulsing, trying to get the butter incorporated. There went my tastebud's dream of a shortbread cookie. Not one to waste food, I finished the dough by patting it into a parchment lined baking dish and baked them. They're soft bar cookies now, and completely edible. But I will make the shortbread version again, next time by using my pastry cutter and making the dough by hand. Side note: I have successfully pulsed foods many times, because I don't own a food processor. And I make peanut butter weekly with peanuts in my VM, so I should've seen that coming. I've accidentally made nut butters before so I completely understand. I'm glad they were tasty anyway! Does the chocolate harden up and stay had at room temperature? Yes, unless it is very hot in your house. These cookies are very good but when I make them they crumble and fall apart. Any ideas? They firm up more if you chill them. You could add an egg yolk next time but they won't be as crisp. Did you bake them on parchment paper? So these are so delicious! However, mine never turn out crispy or crunchy. They're always soft and chewy. And I can't figure out the problem. I had to turn my oven down to 325* otherwise they brown too quickly. But even still they're soft. Do you think you might know the problem? They will never crisp up as much as a traditional flour sugar shortbread but they should crisp a little. Did you use the gelatin and keep the rest of the as listed? These cookies are SOOOO good! Be forewarned though; they're rather addicting. Thanks for an awesome and delicious recipe! I'd love to make these with my son but he's nut free. Do you think they would turn out if I subbed a nut free baking mix, like Briana Thomas', for the almond flour? That would make cookies but probably not a crispy shortbread. Sorry! Wow! These look amazing! Can't wait to try! Gelatin - the regular Knox brand? Can't wait to try these!